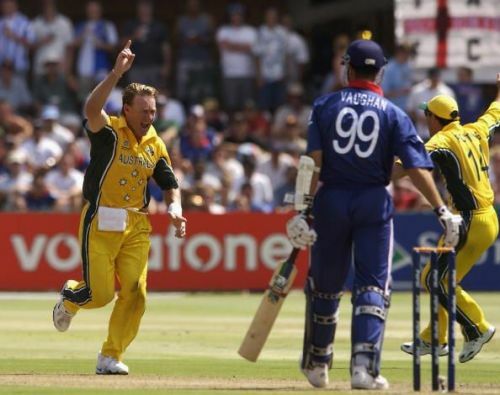 The 2003 World Cup had Australia's dominance imprinted on it all the way, yet they too were involved in a low-scoring potboiler against their perennial rivals, England. England claimed an early advantage with a defiant opening stand of 66 between Nick Knight and Marcus Trescothick, before a flying catch at wide slip by Damien Martyn off Andy Bichel drew first blood for Aussies. The dismissal of the openers triggered the collapse as the duo of Bichel and Glenn McGrath (41-1) wrecked the English middle order. Bichel, with career-best figures of 20-7, single-handedly dismantled the English for 204/8 in 50 overs. Australia looked in trouble after an outstanding opening spell from Andrew Caddick reduced the World Champions to 48/4 in the first ten overs. Australia were in dire straits when Brett Lee was brilliantly run out and the score read 135/8. The Australians got the much-needed lift, when their hero with the bowl, Bichel shared a valiant partnership with Michael Bevan and brought the equation down to 11 of the last 12 balls. It was truly Bichel's finest hour in international cricket as he effectively finished the game with a massive six followed by a boundary to seal a thrilling feat for Australia.